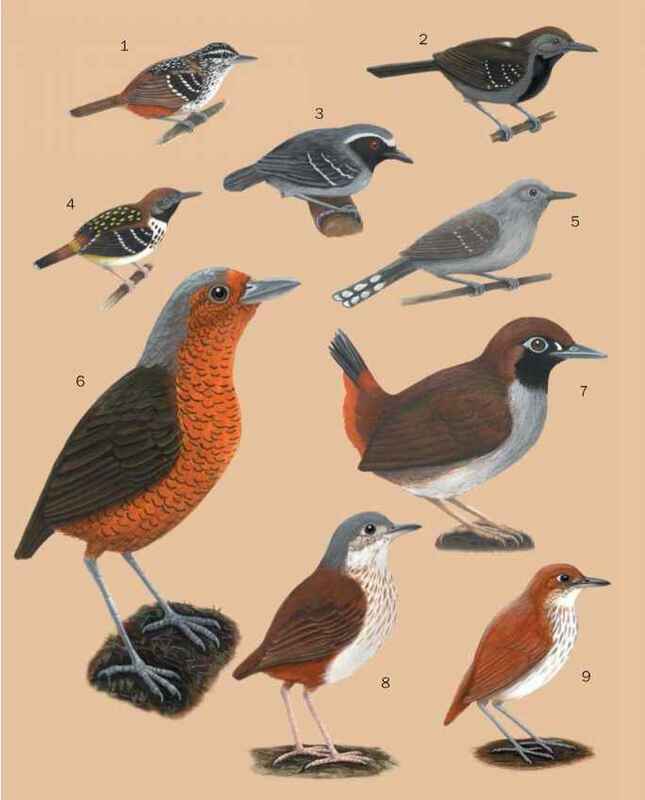 English: Fifebird, bullbird; French: Coracine ornée; German: Kurzlappen-Schirmvogel; Spanish: Pajaro Paraguas. Umbrellabirds have sharp and powerful claws to secure good grips on branches during calling. This group comprises the largest of the cotingas, being about the size of a crow. As is the case with most cotingas, the females are smaller and less dramatic than the males in terms of ornamentation. For example, the male Amazonian umbrellabird is 1.65 times the weight of females, with male weights ranging 1.5-1.6 lb (680-745 g). Both sexes are entirely black, and the male has a whitish eye. This species is found in the western and central Amazonian basin, at lower elevations typically not exceeding 4,300 ft (1,300 m). This species tends to be a riverine island specialist in the Amazonian lowlands, often associated with riverine vegetation (e.g., Cecropia). 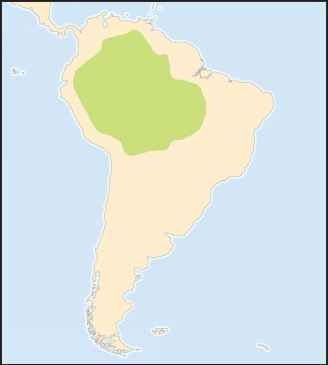 However, along the eastern fringe of the Andes, this species ranges up into montane evergreen forest, more similar to the primary habitat of the other species of umbrellabirds. Males are organized into widely spaced, exploded leks and may displace other males from calling perches. The nest is platform type and built very roughly of loose twigs such that the single egg or chick can be seen from underneath. The nest is often located high in a tree fork. The single egg is 2.2 by 1.4 in (56 by 36 mm), oblong and rather pointed at one end, with khaki coloring with brownish spotting and stippling.